1G. W. Faris (gregory.faris@sri.com) is with the Molecular Physics Laboratory, SRI International, Menlo Park, California 94025-3493. 2V. Ntziachristos is with the Laboratory for Bio-optics and Molecular Imaging, Center for Molecular Imaging Research, Massachusetts General Hospital, Harvard Medical School, Charlestown, Massachusetts 02129. 3D. M. Rector is with the Department of Veterinary and Comparative Anatomy, Pharmacology, and Physiology, Washington State University, Pullman, Washington 99164-6520. 4L. Wang is with the Department of Biomedical Engineering, Washington University in St. Louis, St. Louis, Missouri 63130-4899. 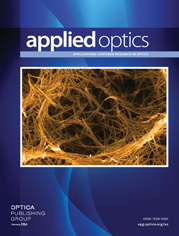 This Applied Optics feature issue on Topics in Biomedical Optics highlights papers presented at the 2006 Biomedical Optics Topical Meeting sponsored by the Optical Society of America. The feature includes 40 papers that represent a cross section of topics that were covered at the meeting.